On Tuesday, Samsung Electronics stated that stronger earnings were expected by the company in the second quarter as growth will be spurred by a pickup in sales of high-end smartphones and televisions after the company posted a second straight fall in profits for the first quarter. It was said by the South Korean giant that the Football World Cup in Brazil would give the sales of smartphones and screen a boost in this quarter as fans would want to watch the action on up-market devices like ultra-high definition TVs. For the company to sustain growth, it is crucial that a revival of sales of up-market smartphones and TVs occur because its mainstay mobile business reported the first share loss of the smartphone market in four years, even though it was responsible for generating about three fourth of the total profit in the first quarter. However, even though there will be positive sports-related demand, analysts have said that the upside for sales of high end devices because of the football extravaganza could be limited because of the dearth of UHD standard content and the steep prices. Some analysts said that smartphone shipments would only see single-digit growth in the current quarter, which would be below street expectations. The tech giant said that the shipments of the handset would be the same as seen in the January-March period i.e. about 113 million, even though most of the April-June shipments comprise of that of the flagship smartphone of the company, the Galaxy S5. Nonetheless, the company said in its statement that it was expecting improved sales of home appliances and display panels in the second quarter because consumers would be looking forward to the World Cup. Shares of the company that are worth $220 billion saw a fall by 1.7%, which is worse than the previous fall of 0.3%. The world’s biggest technology company in terms of revenue announced that from January-March, there had been a 3.3% decline in its operating profit as compared to last year. Profit of the mobile division had also reduced by about 1.2%. According to a senior executive of the company, the biggest smartphone maker of the world is hoping that its premium Galaxy S5 device, which was launched earlier this month, would be able to widen the profit margins by outselling its predecessor. The culmination of heyday of the innovation behind smartphones has left the company facing its first annual decrease in profit in three years. 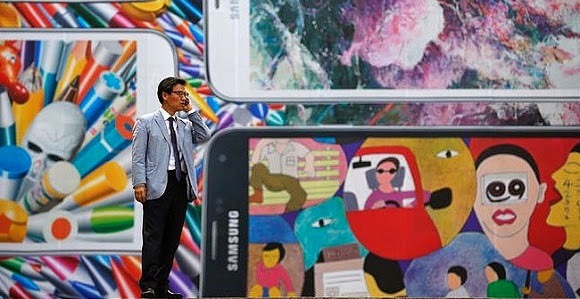 Previously, the South Korean tech giant had posted 5 record quarterly sales until the end of first quarter in 2013. As far as the company’s low-end smartphone range is concerned, it is being stomped upon by the quality improvements being made in Chinese offerings. As for the large screen advantage of its high-end phones, it is expected that the next iPhone would challenge that as well so competition gets tougher for Samsung. Shareholder pressure would increase with any further decline in profitability for lifting payouts or introducing a new growth engine.